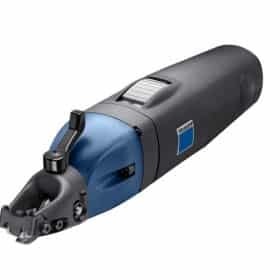 FREE SHIPPING on All Trumpf Power Tools!!! The TRUMPF TruTool C 160 Slitting Shear is an exceptional piece of equipment and a great addition to your stock of sheet metal tools. This slitting shear comes without the integrated chip breaker which provides a wide open view of the working area. There are many advantages to this slitting shear besides just visibility, the TRUMPF guarantee of quality is behind every tool offered. The TRUMPF TruTool C 160 Slitting Shear with the integrated chip breaker is an ideal sheet metal tool for any metal fabrication shop. A cordless slitting shear this hand held shear easily makes it’s way through spiral tubing, sheet metal pieces and stainless steel with distortion free cutting. Ergonomically designed with comfort in mind, this sheet metal tool makes it easy. 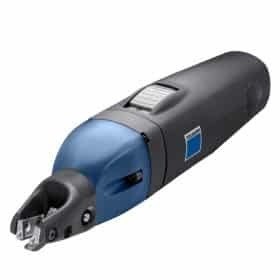 The TRUMPF TruTool Slitting Shear Model C 250 with the integrated chip breaker is an ideal tool for handheld usage. This portable, lightweight sheet metal tool can removed or inserted from any place within the workpiece. Easy to use with one hand, this curve compatible slitting shear gets the job done.